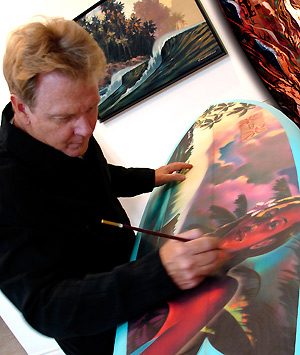 According to Surfer Magazine, “Wade Koniakowsky’s oil paintings are inspired by dreamlike point breaks in Polynesian paradise, jungles, clouds, shadows and mist … trees blow gently in an offshore breeze as a-frames peel and reefs fire in the distance.” The artist, known for these lush tropical interpretations, caters to a growing following on both coasts and in Hawaii, where his work is exhibited in the largest gallery chains in the islands. As an advertising art director, Wade’s 25-year career included campaigns for Fortune 500 brands such as Taco Bell, Reebok, McDonald’s, Microsoft and IBM. After winning over 300 creative awards, his focus shifted to the creation of fine art. His work, which has been selected for movie sets and television shows, can be found in museums and galleries throughout the world.